Trading since 1986 and continuing an established family business, Julie Mclellan purchased the shop after completing her BA(Hons) Illustration degree. 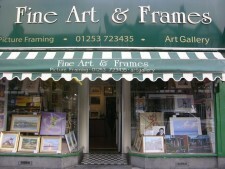 Julie has created a small independent gallery where customers are welcome to browse the artwork and admire some stunning local talent, including Julie’s own original paintings. Her bespoke framing service compliments the artwork for sale, and aims to help you display your own painting, print or craftwork at its best. Whether it be a child's first picture or a tapestry that took a year to complete, all pieces are handled with the utmost care and all frames are made with conservation-friendly materials to ensure that your art is protected within the frame. Julie guarantees that your finished artwork will be a joy both to display and behold.